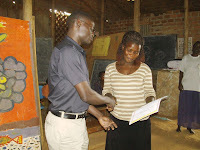 We believe that in order to help vulnerable children it is vital to empower mothers too. Each KCK centre has a Women’s Initiative project running alongside children’s activities. Women from each community come together to learn new skills, and to discuss sensitive issues such as HIV/AIDS and parenting. Our women’s groups have been asking for a long time for Adult Education classes to improve their English skills. 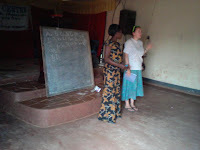 This September two volunteers from the UK and Canada came to KCK Uganda to volunteer with us and launched this adult education programme. Every weekday evening for one whole month a group of over 50 women from Katanga slum attended adult education classes and learnt English. The women not only learnt a lot, but really enjoyed the experience. We would like to say a huge thanks to Katie and Aaron as this programme would not be possible without them. 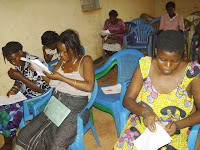 At the end of the month, the women took an exam in what they had learnt, and all who passed received a certificate. 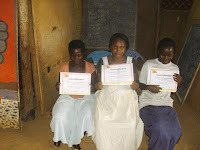 The women were so grateful for these classes, as learning English will not only help them in certain situations, it will also help them to improve their job prospects and benefit their livelihoods as they now have a qualification in English. 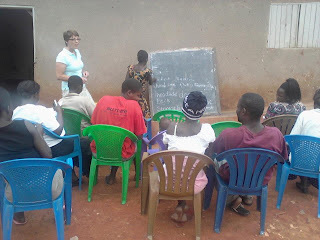 This week, another session of Adult Education classes has begun in Katanga slum, with a different group of women. This programme is going well, and we would like to thank Lucinda for delivering these English lessons. Please pray that these classes go well and the women learn a lot, and that these skills gained can help them to improve their situations. If you would like to come to Uganda to help out with this project and teach English yourself for a few weeks, please contact us. Additionally, if you have any resources or teaching materials that you would like to donate, please contact us. Thank you.